This book demonstrates the breadth of the dream that underlies historical attempts to achieve communal sharing or equality. The author presents his view that the beginnings of the idea of equality and the dream of union with God, are found in prehistoric community patterns. He suggests that these ideas are also found in the very structure of early human descriptions of where we come from and what it was like before we left it - a Golden Age, a Paradise, and Eden. 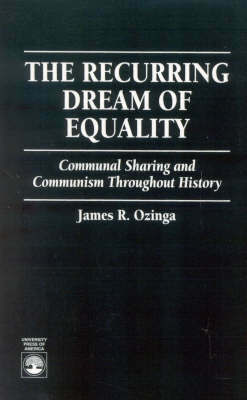 In nine chapters James Ozinga examines conceptual and historical examples of implementation of communal sharing and ideas. He looks at the source of these implementations and their future usefulness. The tenth chapter provides a summary and an analysis of the study and pushes the viewpoint that equality of opportunity is more desirable and more probable than absolute equality. This thoroughly descriptive and illuminative analysis will be highly appropriate for courses on communism or utopias, political philosophy, or the trade market.